The Moccasin, a poetry journal published annually by the League of MN Poets, features members’ original works. The book is a perfect bound, 80-page collection of poems beautifully designed and edited by members. Copies may be purchased for $10.00 each plus $1.25 postage. Each member in good standing receives one complimentary copy. All members are encouraged to submit their work. The Moccasin accepts ONLY poems and ONLY from League members. Previously published poems are accepted. Submitted poems must not exceed 32 lines. Electronic submissions are encouraged, preferably .doc files. Please put your name, email address, phone number and postal address in the upper right hand corner of each page. All poems except haiku and senryu must have titles. If your poem’s punctuation breaks from convention, please include a statement of your intention. Or it may be edited conventionally. DEADLINE for submissions is always the second Saturday in July. While The Moccasin accepts previously published poetry, we only list credits for previous publication for the NFSPS contest winners and poems published in other magazines and anthologies. 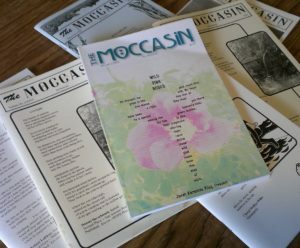 The Moccasin prints up to three NFSPS contest prize-winning poems by any given member per issue/year. NFSPS contest winning poems may exceed the 32 line limit. To submit a Word file via email use our contact form to request submission instructions and we will reply with more details.